Road Victims Trust - The Huckle's jump for Dad! Home › News › The Huckle’s jump for Dad! The Huckle’s jump for Dad! The Huckle family from Biggleswade in Bedfordshire took part in a free fall parachute jump on 25th August 2018 to raise funds for the Road Victims Trust in memory of their Father and Husband, Alan Huckle who was killed in a road traffic collision in July 2014. 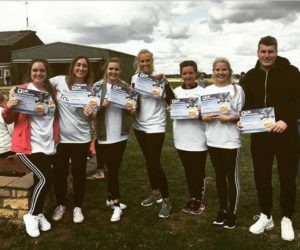 His two daughters Tanya and Kayleigh were joined by friends Chris, Sammy, Char, Beth, Alice and Hannah who ski dived out of a plane from 12,000 feet and raised in excess of £2,000 for the Road Victims Trust. The Road Victims Trust is a registered charity that provides free emotional and practical support to all persons affected by road death in Bedfordshire, Cambridgeshire and Hertfordshire. ‹ Oh what a night!